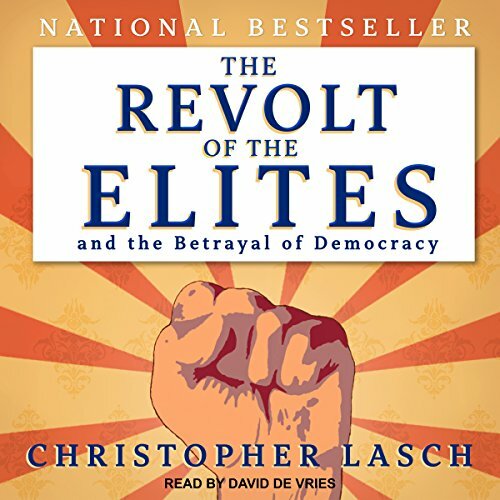 In this challenging work, Christopher Lasch makes an accessible critique of what is wrong with the values and beliefs of America's professional and managerial elites. The distinguished historian argues that democracy today is threatened not by the masses, as Jose Ortega y Gasset (The Revolt of the Masses) had said, but by the elites. These elites - mobile and increasingly global in outlook - refuse to accept limits or ties to nation and place. As they isolate themselves in their networks and enclaves, they abandon the middle class, divide the nation, and betray the idea of a democracy for all America's citizens. This is Lasch's clarion call for a return to the virtues of community, responsibility, and religion. Last chapter was excellent. In others, easy to get lost. This might be better appreciated in book form, where you can digest and ponder each topic.